ALTUS, OK (KSWO)- Inspiring to aspire.That's the goal The Altus Air Force Base hopes a visiting group of cadets with the Air Force JROTC will shoot for. 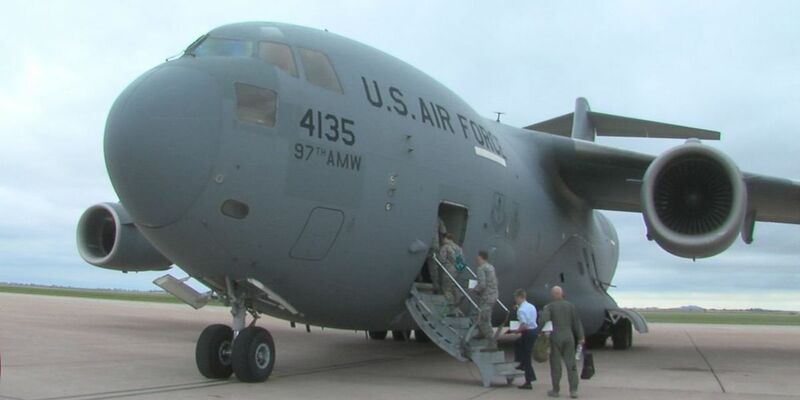 About 25 cadets from Denton High School in Texas got the opportunity to fly over the Altus Air Force base then to the Texas panhandle and back on a U.S. Air Force C-17 Globemaster III cargo aircraft. During the flight, cadets spoke to pilots, load masters,and engineers about their roles and responsibilities. The purpose of the flight is to prepare students for the Air Force and show them the variety of careers available to them. Air Force C-17 Globemaster III is used for different missions across the country and overseas, but today it was used as a valuable tool and resource for junior cadets from Denton,Texas. One by one the cadets boarded the plane waiting eagerly for take off, then soaring over 25,000 feet in the air they got to experience what it's like from the perspective of an airman in the Air Force. "Working hands on with people that already do it, its awesome. It's a once and a lifetime thing," Sweeten said. Sophomore Branden Sweeten is thinking about joining the Air Force. Sweeten already has a little experience piloting a plane. "I've actually flown a small Cherokee 180 before, not a big plane its 4-seater but once you get up there its fun, you get to relax and telling someone you get to fly a plane that's one of the coolest things you will be able to do," Sweeten said. During the flight each cadet got a chance to strap in with the pilots and see an in flight refueling mission between two air crafts. "Just seeing a plane that big, it shouldn't be that close to another plane, it was ridiculous," said Sweeten. "It was really cool and a little intimidating too, especially being in the cockpit like looking up at it. It was really cool to see how the process works," Hobon said. Junior Cassidy Hobon said she joined JROTC to gain leadership skills. She said you don't get to experience trips like this everyday, and it was interesting to see what the airmen do. "I actually learned the different jobs in the Air Force like a load master so that was really cool, also it was a once in a lifetime thing I've never done something like this and so it was really cool to see how it works," Hobon said. Retired Lieutenant Colonel Robert West served in the Air Force for 24 years before retiring from the Pentagon in 2007. He now serves as the Senior Aerospace Science Director at Denton High School. In the past 5 years the school has been to the Altus Air Force base twice exposing cadets to the aerospace industry. Something West said is a rewarding experience. "These kids that I have so much potential, and to watch them grow as young freshman up to seniors and get to that point where they need to make a decision on if they want to go into to military, or post secondary education, or going to college, and major in engineering, this gives them another option another choice to look at," West said. At the end of the flight the cadets also got to see a combat off-load where equipment is loaded off the plane with a palette to show them how food, water or other supplies are dropped to other airmen and troops in different countries. West said the most memorable part of it all is seeing the cadet's reaction. "It was just overall an great experience for the kids, and I know it will be an experience they will remember for the rest of their lives without a doubt," said West.